This is another installment of our series featuring B.C. places used as room names in the Irving K. Barber Learning Centre; this time we are going to take a look at the Columbia River. The Columbia River originates in the B.C. Rocky Mountains and flows down to the Pacific Ocean just north of Portland, Oregon. 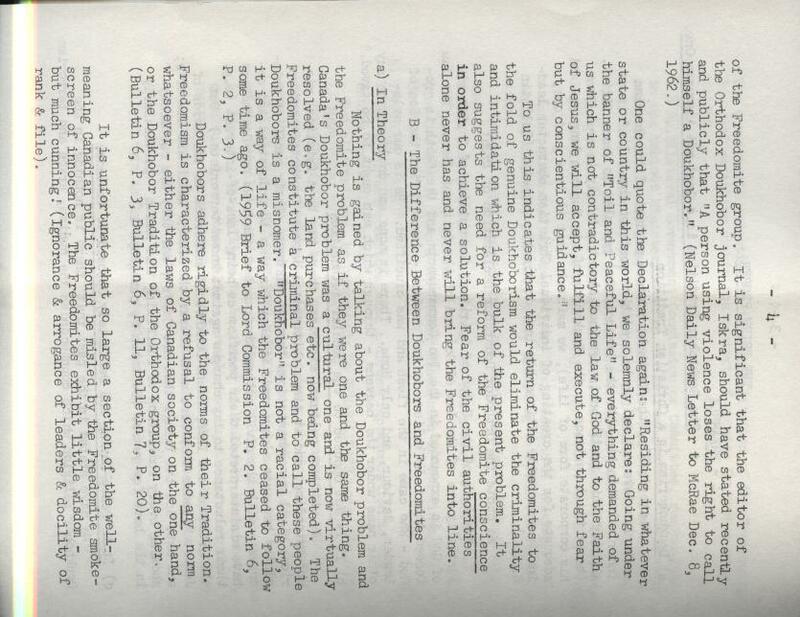 The resource from our collection that we would like to feature from the Columbia River area is a small publication titled A Brief Containing Suggestions for the Solution of the Freedomite Problem. 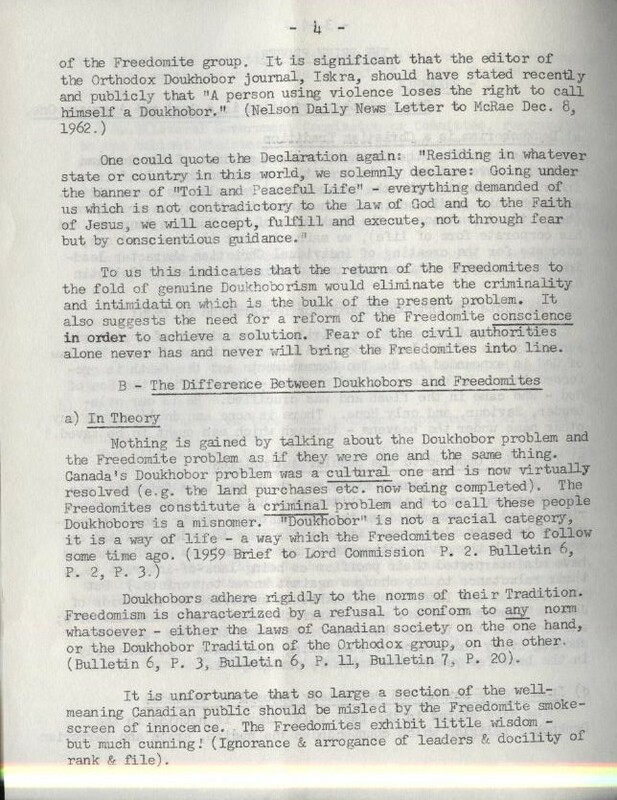 Freedomites are a radical religious group that originated from the Russian Doukhobor sect which has many past and present settlements along the Columbia River in the western part of the Kootenays. 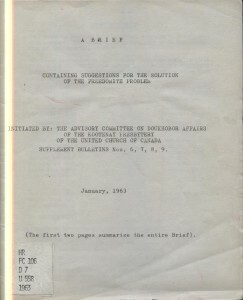 This booklet was released by the Advisory Committee on Doukhobor Affairs of the Kootenay Presbytery of the United Church of Canada in 1963 and contains practical information on how the government and citizens could deal with the public nudism and violent terrorism that was perpetrated by the Freedomite group at this time. One of the first things the booklet points out is the difference between Doukhobors and Freedomites. This is a very important distinction to make as the Doukhobors abhor violence of all kinds, making the actions of the Freedomite zealots very upsetting for them. 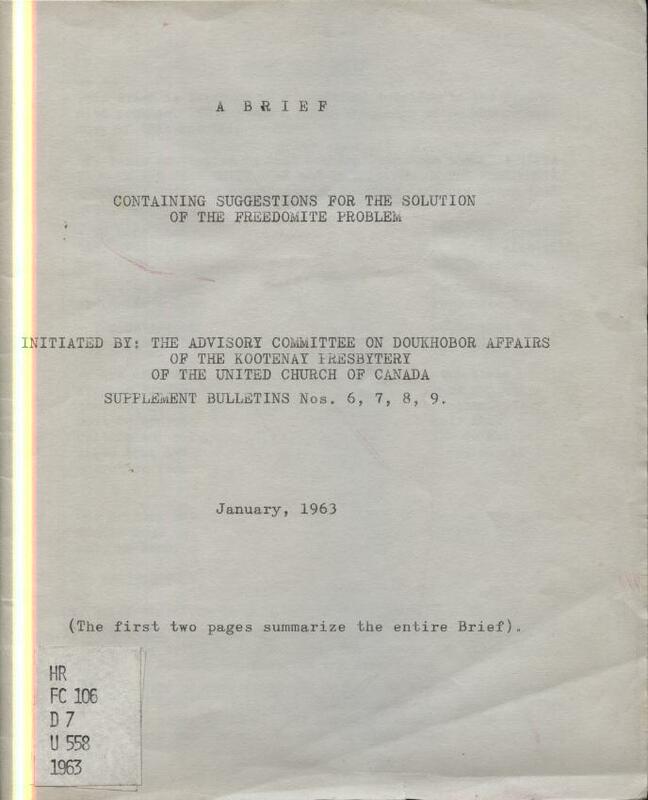 Still, many British Columbians today – and even History professors – use the term ‘Doukhobor’ to refer to members of the Freedomite group, which is incorrect and can be upsetting for people of Doukhobor descent today. Since the Doukhobors, and subsequently the Freedomites, are an important part of B.C. history, you may want to learn more about them. Wikipedia is a great place to get started, as well as the website Doukhobor.org, which is primarily a genealogy website but also has many very informative articles on the Doukhobors as well as a number of links to other sites that can tell you more about the group. The UBC library catalogue shows many resources available to learn more about this group, over 600 of which are housed in our Rare Books and Special Collections library. We also have many primary sources to peruse in our archives, most of which can be found in the Doukhobor Collection. In the Barber Centre, the Columbia River Room is room 316. It is a group study room located in the Irving K. Barber Learning Centre Library.